Give your favorite meats and poultry a mild nuttiness with Kingsford® Charcoal with Pecan. Made with 100% natural ingredients and North American wood, Kingsford® Charcoal with Pecan adds a balanced and nutty wood flavor to all of your favorite foods. Stronger than fruit woods, but milder than hickory, pecan smoke makes for an incredible smoked turkey, adds an intriguing flavor to briskets, and brings out the best in pulled pork. And just like Kingsford® Original, it lights fast, is ready to cook on in about 15 minutes and burns longer than competitive brands. * Available in a variety of sizes, from 4-lb. to 16-lb. bags. 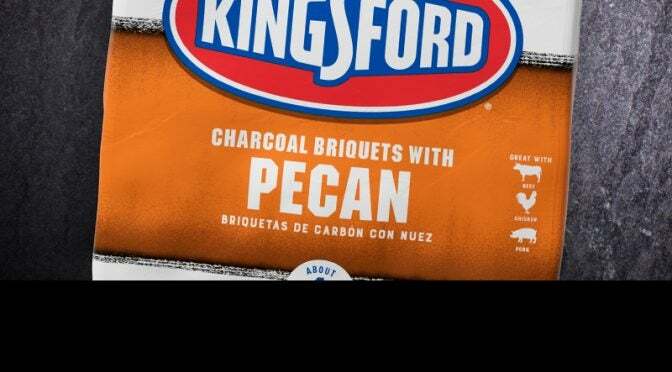 * Compared to the leading store brand charcoal in the U.S.A.
Add delicious smoke flavor with Kingsford® Charcoal with Pecan.